Tesla has been removed from the investigation into the fatal crash of one of its semi-autonomous vehicles. In March, a Tesla vehicle operating in Autopilot mode crashed in California, killing the driver. Tesla has suggested the driver was at fault. On Thursday, the National Transportation Safety Board said Tesla had “violated the party agreement by releasing investigative information”. Tesla says it decided to remove itself from the investigation. Tesla’s Autopilot is a semi-autonomous mode in which the car controls its own steering and speed. The company has always stressed that drivers must pay attention to the road and keep their hands on the steering wheel. 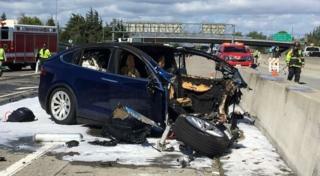 On 23 March, a Tesla vehicle crashed into a roadside barrier in California, killing 38-year-old Walter Huang. Tesla said the vehicle was in Autopilot mode at the time of the crash. “The driver had received several visual and one audible hands-on warning earlier in the drive,” it said in a statement. The NTSB has accused Tesla of releasing “incomplete information”. It said such statements “often lead to speculation and incorrect assumptions about the probable cause of a crash, which does a disservice to the investigative process”. Robert Sumwalt, NTSB chairman, said: “We decided to revoke Tesla’s party status and informed Mr [Elon] Musk in a phone call and via letter. Tesla said it had decided to remove itself from the investigation. The company has accused the NTSB of breaching its own rules by releasing statements about the crash, despite telling Tesla not to do so. “We don’t believe this is right and we will be making an official complaint to Congress,” a spokesperson told the BBC. Tesla added: “Last week, in a conversation with the NTSB, we were told that if we made additional statements before their 12-24 month investigative process is complete, we would no longer be a party to the investigation agreement.